Wanapum has been gelded and is not available for breeding. Pure Spanish, revised son of 16.3 hand Competidor XIII who Ami MacHugh imported from Spain. I fell in love with Compe the minute I saw his first photos. When I decided I wanted another unrelated stallion as Hereje concluded his breeding career, my search led me to fall head over heels with Wan. 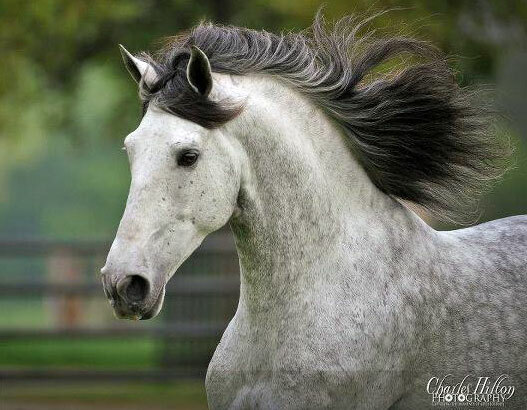 Wanapum's dam, Samba, also imported from Spain, is the dam of the amazing Kianto who has won and produced countless national champion conformation and performance horses. Even as a yearling, it was obviously than Wanapum had power and agility that is rare to find, even in our beloved breed. The older he got, the more dramatic his movement. When Valente started Wanapum under saddle, we believed we had never had a horse that loved to work and was able to focus as he does. There are too many things to list that I love about Wan but I guess the top of the list is the fact that he has enormous bone, a gorgeous head and profile, an eye that you can hardly help but drown in, effortless use of his body and such hind end driven power. As a bonus, Wanapum is heterozygous grey (Gg) and homozygous black (EEaa). 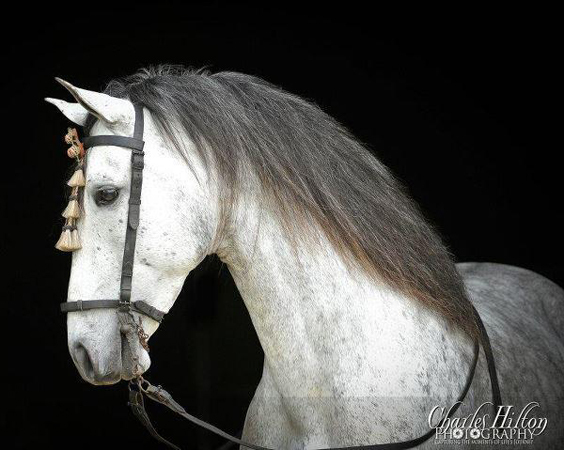 Valente did a masterful job when he showed Wanapum in the 2012 IALHA National Show Junior PRE Stallion class. In the performance portion of the class, they scored a very high 82, 12 points higher than anyone else in the class, so that Wanapum was awarded the National Championship Junior PRE Performance. 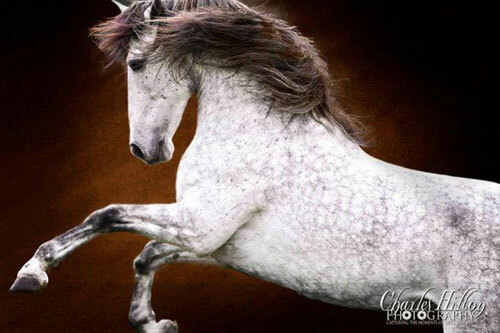 In the overall class, Wanapum was Reserve National PRE Junior Stallion. Following that show, I had the unbelievable opportunity to have my friend and trainer, Julie Van Zee of Maple Ridge Iberians in Michigan, take Wan for training and to expose him to more dressage tests than we would have been able to expose him to. Wouldn't you know that Julie and Wanapum were grand champions in 1st level at the very first show they went to! One of his tests is shown below or at http://youtu.be/vjUBxFs5txU.